Rastakhan's Rumble didn't feature a Paladin Secret, but now we have a new one in Rise of Shadows! No Surrender was unveiled by CarryPotter on YouTube. The video is in Spanish and contains gameplay of the new card. A lot of people seem to think this card is really powerful, since it can compliment well an Aggro/Secret Paladin deck, it synergises with Bellringer Sentry and it keeps stuff like Secretkeeper alive. Personally, I am not too sold on it, since Aggro Paladin's cheap and small minions or your dudes will still die from most board clears even after the +2 health buff applies. What do you, guys and gals, think? Does the effect happen before the spell goes off? Like will this protect a 1/1 from dying to consecrate/blizzard/whirlwind? If so it's an amazing counter if there's any good secret synergy for weenie decks. It should trigger before the opponent's spell is resolved. At the moment, I think that the only other cards using this wording are 3 Mage secrets (Counterspell, Spellbender and Mana Bind). At least for the first 2, the secret is clearly triggered before resolution (or lack thereof, as far as Counterspell is concerned), otherwise they couldn't work as designed. When the secret triggers after the condition is met, the wording is "after your opponent...", for example Mirror Entity. To answer Zadina's question, this card looks reasonably good to me. 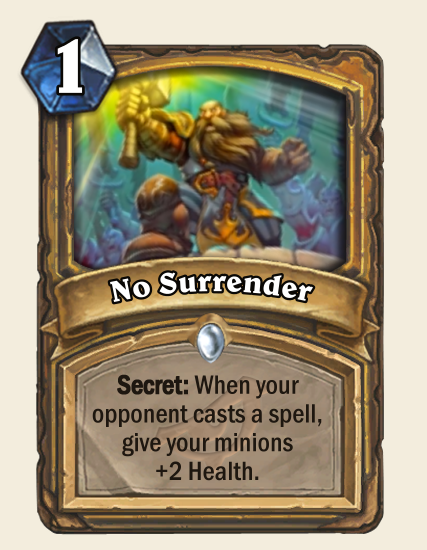 Sure, it's not going to make Silver Hand Recruits survive Flamestrike, however it will help against many other popular AoE damage spells such as Arcane Explosion, Shooting Star, Blizzard, Fan of Knives, Explosive Trap, Consecration, Holy Nova, Beakered Lightning, Dread Infernal, Whirlwind and Dragonmaw Scorcher. That's a long list! These are minions, so your opponent has to play a spell first, then drop these. If not, 1/1s still die. About the card, I'm with Zadina on this one. This card might have been maybe good in Odd Paladin, but its not an option anymore, so, its probably not good. This is true. On the other hand, players tend to play spells once in a while. So far, no Paladin secret would trigger on spells, unlike Mage secrets. With this new secret, this is a new trigger condition the opponent will have to plan with. I find it interesting. Don't get me wrong, I'm not saying it is a marvelous card. But I think it is better than other Paladin secrets in Standard.